Turkey’s Selah Shipyard, which expanded its capabilities last year by setting up a new facility, is currently implementing prestigious projects and expects to play a more dominant role in the future. 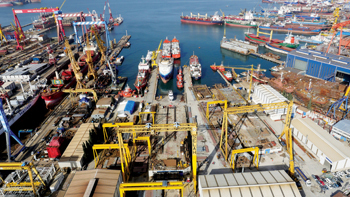 Selah Shipyard was established in Tuzla-Istanbul in 1982 by Selah Shipbuilding Industries, a group well-known since 1954 in Turkey’s automotive and production sectors. The group set up a new facility, the Körfez Shipyard in the Kocaeli Free Zone in August 2014, which effectively doubled plant area. One of Selah’s recent achievements was its delivery of a platform supply vessel (PSV), measuring 79.45 m in length with a beam of 16.80 m. It was constructed and equipped in compliance with FFV Class 1 and DP2 class notations and in accordance with ABS classification and the Italian Flag Authority. Built as the company’s project H66 under the name of Levoli Sapphire, it is now serving in the Caspian Sea as the Caspian Voyager. Currently under construction at Tuzla is project H67’s PSV with similar notations as the previously built craft. It will be a high-tech vessel with azimuth and multipurpose capabilities with facilities including a moonpool and helideck. Selah is also in the process of building at the yard two logistic supply vessels for the Turkish Navy under a contract from SSM, which is the Turkish undersecretariat for defence industries. The first of these will be delivered in June 2016 and the second in April 2017. Measuring 102.29 m in length with a beam of 16 m, the craft will be built according to the Turkish-Lloyd notation. They will be powered by two main engines, each developing 1,380 kW, and have furnished accommodation for 52 people. Additionally, at Tuzla, work is underway for the turnkey construction of two offshore platform support vessels for Italy’s Marnavi company. “It is estimated there will be a 100 per cent increase in employment as contracts for the Turkish and Italian vessels will simultaneously go on at the same yard,” said a Selah spokesman. Meanwhile, Selah has signed two new contracts to build 84 m long DP2 and FFV Class 1 PSVs under projects H69 and H70. The vessels will be in compliance with anchor handling vessel, oil recovery ship second line notations. The company has also participated in a new assault boat tender. It has responded to an information request document under a programme dubbed Turkish-type assault boat. It has also completed designs for a logistic support vessel, a fast patrol boat and a fast attack boat for the Turkish military and stands ready to build them. At the Selah Korfez Shipyard in the Kocaeli Free Zone, construction is ongoing for an offshore platform support vessel for Marnavi. The spokesman said the company plans to increase investments at the Korfez yard while investments will be boosted at Tuzla to meet the requirements of military projects. Selah says the quality of its facilities and staff competence helped it achieve much. The Tuzla shipyard covers 45,000 sq m and has two slipways of 27 m x 140 m and 30 m x 150 m. There are three quays fully equipped for ship repairs and outfitting. It has CAD/CAM systems, gantry cranes with lifting capacity of 200 t, modern machinery and workshops. Total steel-processing capacity is 17.000 tonnes annually. “Through the efforts of the management team, engineers and workers, Selah is very customer-oriented and holds a leading position in its industry,” the spokesman says. Selah Shipyard has highlighted it can deliver modern tankers, multi-purpose dry cargo and container vessels, special-purpose military and commercial vessels, cement carriers, offshore support/supply vessels, fishing vessels, barges and pontoons up to 30,000 dwt at competitive prices and shortest delivery times and in accordance with the rules of international class societies. Selah Shipyard has an integrated management system comprising quality management (ISO 9001:2008), environmental management (ISO 14001:2004) and occupational health and safety management (OHSAS 18001:2007). The Korfez Shipyard, encompassing 44,700 sq m, has a slipway of 50 m x 161 m, three covered halls of 121 m length each, gantry cranes with capacity of 160 tonnes, modern machinery and workshops. Selah has outlined its own vision ahead of the 100th anniversary of the Turkish Republic in 2023. It seeks to fully utilise its capacities in both shipyards with a focus on constructing military ships in Tuzla and primarily export-oriented ships at the Korfez yard. The plan is to construct high-quality products in completely closed hangars in an environment-friendly setting. The vision includes modernisation, boosting exports by at least 50 per cent and developing manpower quality and numbers. Also among the goals are supporting domestic ancillary industries and small and medium enterprises (SMEs) and enhancing coordination between the SSM and its shipyards for national military and supply projects. For the near future, Selah hopes to more than double its performance in 2015 over 2014 in terms of exports, production and employment.